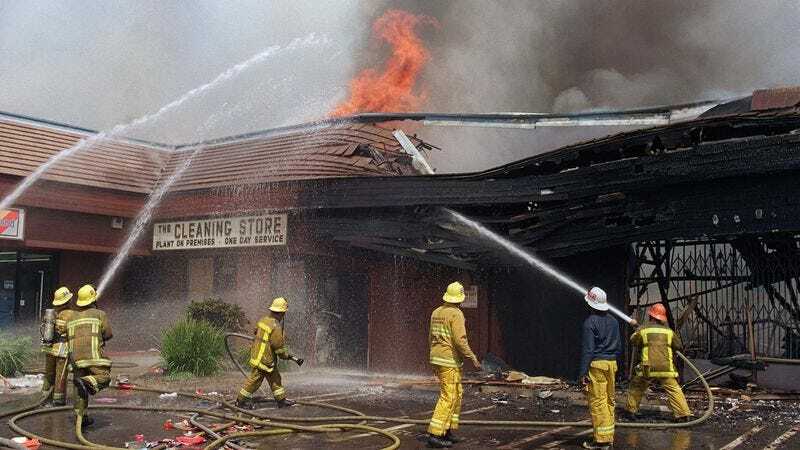 WASHINGTON—A new report from the U.S. Small Business Administration reveals that being consumed by flames poses an even greater risk to small companies than originally thought, typically causing ruinous insolvency within the first six hours of conflagration. “The data we’ve gathered reveals a consistent pattern of business failure shortly after the start of a fire, which can lead both to inventory problems and a difficulty attracting customers, who, quite frankly, do not wish to step into a retail location that is currently ablaze,” said SBA administrator Karen Mills, whose staff inspected dozens of flaming businesses in preparing the report. “For example, a small family-run electronics store in a downtown location with thick, choking smoke raging through its aisles is going to be hard-pressed to compete with the big box stores that have highly competitive prices and aren’t on fire.” The report noted that fires have less of an effect on Internet retailers, whose customers continue to shop online even as their houses burn down around them.